Montreal, summer, and music: three words that sound perfect together. Of the numerous music festivals that took place during the summer season, there is one in particular that caught our attention, maybe because music lovers wait an entire year for this weekend of musical and artistic enchantment. We’re talking of course about the Osheaga Music & Arts Festival. The festival, which took place from Aug. 2 to Aug. 4 on the beautiful site of Parc Jean-Drapeau, celebrated its eighth anniversary this year. 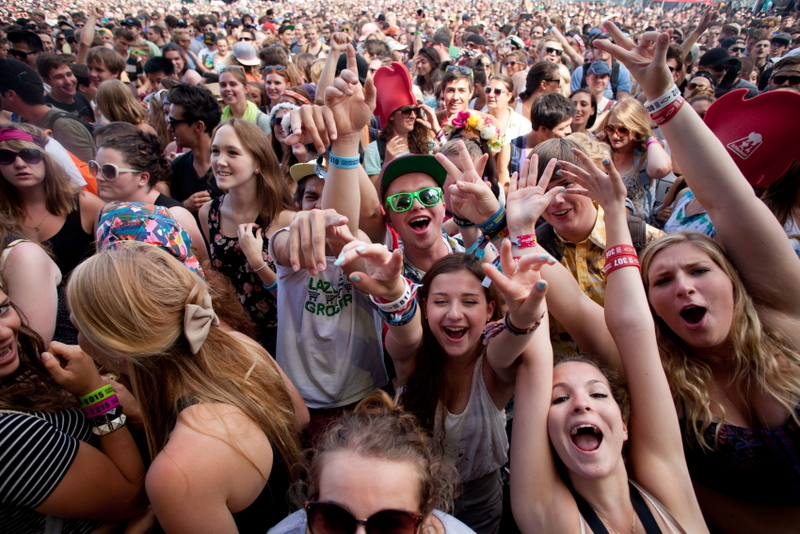 Every year, Osheaga attracts more and more international spectators and welcomes them with open arms. Flags from all over the globe were displayed proudly across the terrain, showing Montreal’s pride in its diversity. There were high expectations for this year’s edition and it is safe to say that they were met. First, the lineup pleased music lovers of every genre. Second, the schedule was more than satisfying. Of course, it can never be perfect, but with more than 30 artists per day and five stages, festival goers had the possibility to experience most of the performers even if they were playing simultaneously. Despite the great lineup, many music lovers were unable to attend all three days of the summer bonanza and were therefore forced to choose between which sets they would rather see. But with amazing artists performing each day, Osheaga attendees witnessed Capital Cities kick off the festival with energy, they sunbathed with Daughter, Ben Howard and Alt-J, clapped their hands with The Head & The Heart, heard Ellie Goulding’s adorable british accent, sang out loud with Vampire Weekend and Phoenix, dreamed with Beach House, travelled back in time with The Cure and danced with A Tribe Called Red. Vampire Weekend’s Ezra Koenig on stage at Osheaga 2013. Press photo. Many concerns about the traffic flow onsite were brought up – apparently there had been some problems last year – but it seemed like everything had been fixed so that all daily 40,000 concert goers could enjoy their experience. Also, the various types of food installations were pleasing to both the vegetarian as much as the carnivore and the sweet tooth. Osheaga not only had a strong musical scene, it also celebrated the arts in general. Thus, in the peaceful surroundings near La Scène Verte and La Scène des Arbres, people could devote themselves to various artistic activities such as graffiti, chalk drawing or body painting. A tent was erected for an exposition called Musique sur papier, which consisted of 50 or so concert posters made by different graphic designers. The festival’s decorators should also be properly credited for their work. The decorations completely enthralled the festival goers and propelled them even further into a place of wonder and delight. There were small bulbs, big luminous balloons, origami-styled lamps, naïve and colourful writing made out of wool and ropes. Although it’s been said over and over again, there is no denying the fact that the Osheaga Arts & Music Festival is nothing short of spectacular. Even though the previous years were astounding, it seemed like this year’s edition allowed the festival to reach a whole new level of musical excellence.